Scallops Provençal, Thyme for Cooking easy gourmet dinner. You can use all scallops or all shrimp in the Provençal. Tender scallops, quickly sautéed and finished with a tomato, white wine and tarragon sauce. You can use either the small (bay) scallops or the larger (sea) scallops in this dish. Remember to cook them quickly to retain their tenderness. Large scallops can be cut in half. Baking and serving from individual casseroles makes a lovely presentation. 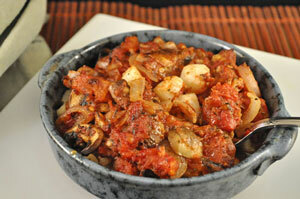 Open and drain tomatoes, reserving sauce for another use. Roughly chop tomatoes. Heat 2 tsp oil in medium nonstick skillet over medium-high heat. Add scallops and sauté until light brown and opaque, being careful not to crowd. They sometimes have a lot of water in them and you want them sautéed, not steamed. 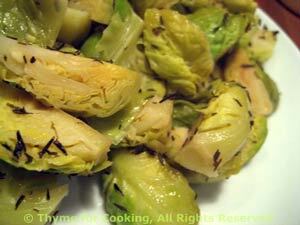 As they brown remove them and put them into 2 individual, shallow casseroles or one larger one. In same pan sauté shrimp until they start to curl and turn opaque. Put into casseroles with scallops. Add remaining 2 tsp oil to pan along with the shallot, garlic and mushrooms. Sauté until shallots are tender and starting to brown. Add tomatoes, wine, tomato paste and herbs. Bring to a boil, reduce heat and simmer, uncovered, 10 minutes. Add vinegar to sauce and stir. Spoon sauce over scallops and shrimp. Bake at 400F (200C) for 10 minutes, until heated through. Serve directly from casseroles. If using individual casseroles place them in a baking sheet for easy handling. This near-perfect food of the Incas has slowly been gaining recognition in the culinary world. It cooks quickly and has a nutty flavor that goes with everything. 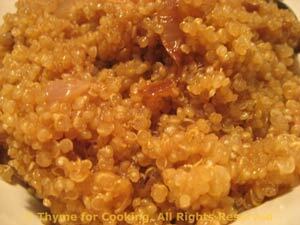 The browned shallots add a dark, mahogany color to the quinoa and a bit of sweetness. Peel and roughly chop shallots. Heat oil in a small saucepan. Add shallots and sauté until brown, about 10 minutes. Add quinoa, stock, cover and bring to a boil. When done, fluff and serve.